We're mad we didn't think to wear our scarf this way first. Pre-fall—the collection that hits racks between July and September—is generally the most wearable. These clothes have to be versatile (to accommodate the varying temps of those months), layer-able, and easy. We've also come to expect pre-fall to hand over accessible styling tricks we can apply to our IRL wardrobes. Here, see how Chanel, Versace, and more of fashion's heavyweights are influencing the way we dress. 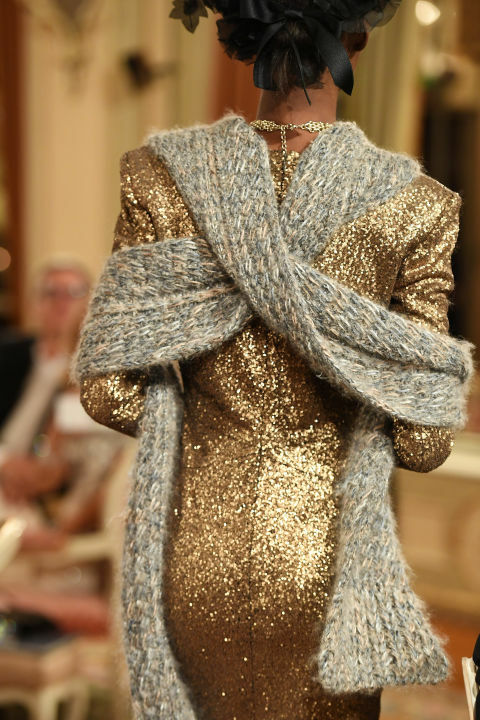 Marled Scottish knitwear is part of Chanel's DNA (see the fashion house's Edinburgh-inspired pre-fall collection from 2013), but the styling of the nubby scarves this season was a stroke of genius. The scarves were draped in front of models' necks, crossed over in the back, and then wrapped around each arm for a half-shrug-half-scarf accessory. It's so much better than letting your extra-long scarf drag along the pavement. Pre-fall is intended for transitional weather, so layering is key. Take Max Mara's mesh long sleeve for a spin during those confusing months when a tank is too little and a sweater is too much. Ever struggle with your bag worn over a heavy coat? Wearing a soft leather cross body atop a scratchy wool coat with a heavy-duty zipper and say good-bye to that scratch-free finish. Versace offered a simple solution to try ASAP: Wear your bag under your outerwear. Duh.